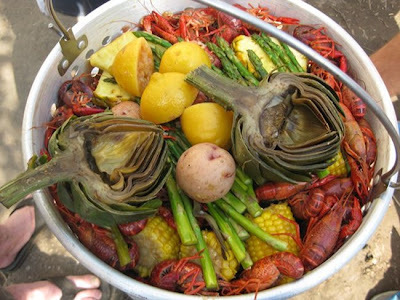 Yes, we boil crawfish, we boil shrimp, we boil crab but we also boil vegetables! One of the things I like to do is gather some great vegetables together and boil them in seafood seasoning. Sometimes I serve it with just a store bought shrimp cocktail but mostly I serve it with a broiled or grilled meat or fish or something I have leftover. What a healthy and tasty meal! Any type of vegetable will do as long as it will hold up. Here is what I generally boil. Put seasonings, lemon and garlic in a large soup pot and add 1/3 pot of water. Boil for 5 minutes. Add vegetables and then add water to cover 1". Bring to a boil and cook until done. Allow to sit in seasoned water for 15 min. Drain and serve. Butter or margarine may be used on corn and potatoes. Good stuff! ***These make good leftovers too!